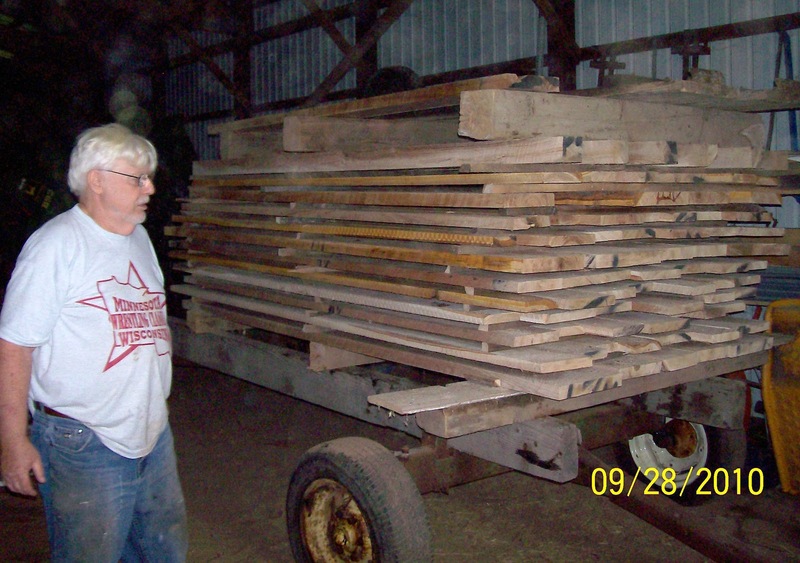 Harvesting and processing lumber to make stools and stands. Take advantage of a break in chemo. Last spring my brother and I cut a couple red oak saw logs from his woods and hauled them to a lumber mill in Frederic. This worked so well that we've been itching all summer to do some more. This break in the chemo, and some beautiful weather, gave us the perfect opportunity. 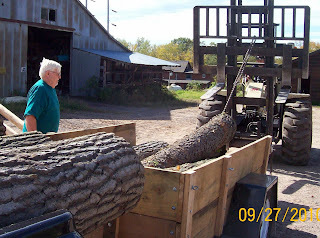 We dropped two beautiful red oak trees - infected this year with oak wilt and dieing - and cut two saw logs from each. Then we cut two Black Cherry that were getting on in years probably past their prime already. After we got them down we discovered that one had begun to hollow in the middle already. 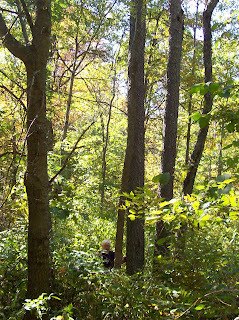 Each had two good saw logs and possibly a third. Only a little loss in the middle of the one that will be easy to cut around. We set up this old hay wagon to haul the logs out of the woods and back to the farm. 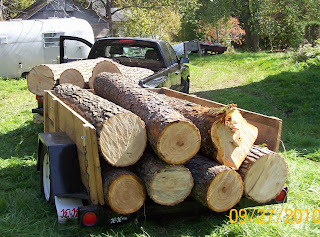 I used the Kubota with pallet forks to load these logs. We chained them down to the wagon to keep them from rolling off as we pulled the wagon out of the woods via the 'logging road'. In order to navigate we had the tractor (FWD) pulling the truck which pulled the wagon. 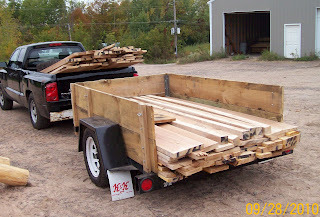 We loaded a total of 12 logs on this wagon before we got out of the woods (8 Red Oak and 4 Black Cherry). The old hay wagon didn't look like it would survive the 20 mile trip to the saw mill so we moved 10 of the logs to the truck and trailer. This was probably a bit over-loaded but we took the back roads and didn't go over 20 MPH. I followed in the car just in case. Heavy equipment makes quick work. 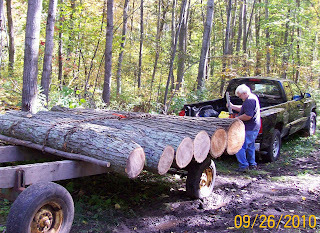 At the mill each log had to be lifted and a chain put around to drag off the trailer. 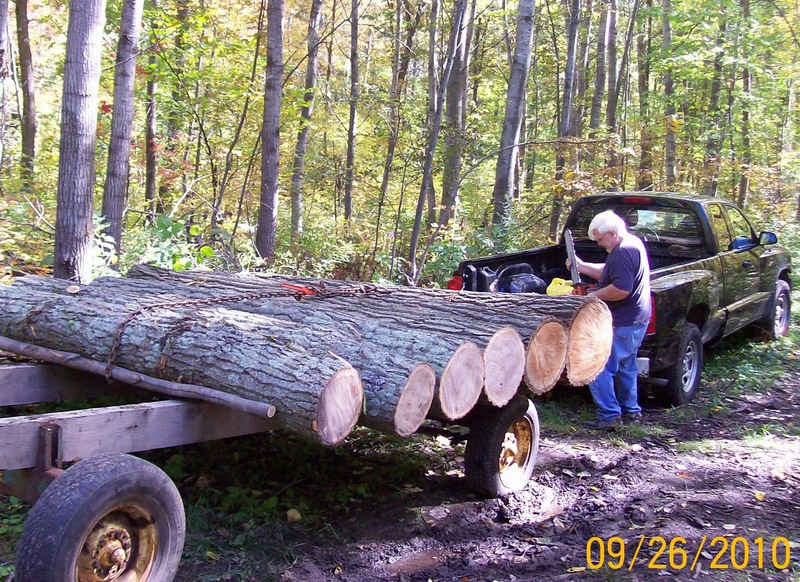 We were thinking we could have wrapped the logs with a chain before loading but this actually didn't take long at all. Doesn't look like much but it's still a full load. Nearly 800 board feet of red oak and black cherry. This load is only slightly less heavy than the logs but it stacks better. Stacked and stickered in the shed to begin drying. Red Oak and Black Cherry stacked to dry. We would have preferred to let this dry up a little before stickering but we don't have the luxury of time during this on this trip. The weather will be cold enough now that there shouldn't be a problem with fungus developing along the sticker pieces.